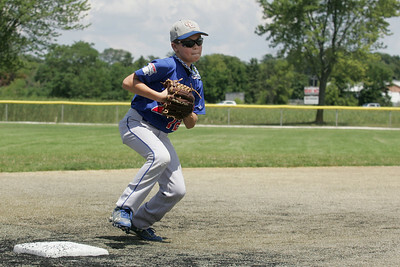 The McHenry County Youth Sports Association held a baseball skills competition Friday, July 27, 2012 at Lippold Park in Crystal Lake as part of the Summer International Championships which runs July 27 - August 5. 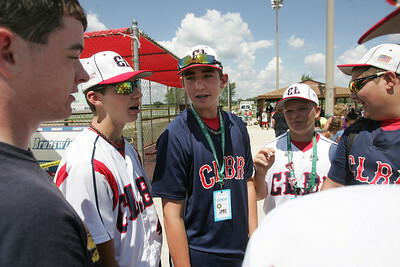 Mike Greene - mgreene@shawmedia.com Members of the 15 year-old Crystal Lake Babe Ruth team talk before the start of the McHenry County Youth Sports Association baseball skills competition Friday, July 27, 2012 at Lippold Park in Crystal Lake. The competition was held in conjunction with the Summer International Championships which runs July 27 - August 5 at various fields in the county. Mike Greene - mgreene@shawmedia.com Crystal Lake Bulldogs' Danny Drzewiecki, 11 of Crystal Lake, practices "Around the Horn" with teammates before the McHenry County Youth Sports Association baseball skills competition Friday, July 27, 2012 at Lippold Park in Crystal Lake. The competition was held in conjunction with the Summer International Championships which runs July 27 - August 5 at various fields in the county. 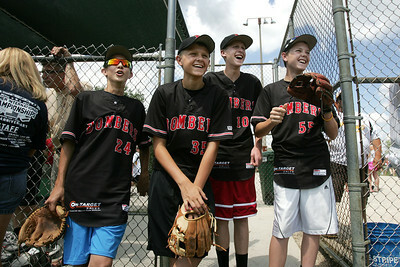 Mike Greene - mgreene@shawmedia.com Crystal Lake Bombers' 15 year-olds Jeremy Gregory, Owen Siddons, Anthony Simboli, and Kyle Wolinski laugh while watching teammates compete in the around the horn challenge during the McHenry County Youth Sports Association baseball skills competition Friday, July 27, 2012 at Lippold Park in Crystal Lake. The competition was held in conjunction with the Summer International Championships which runs July 27 - August 5 at various fields in the county. 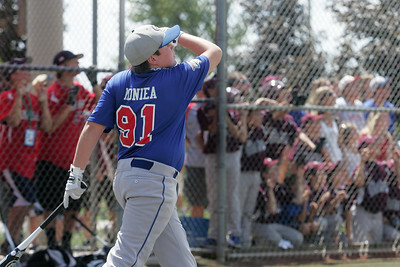 Mike Greene - mgreene@shawmedia.com Crystal Lake Bulldogs' Matt Moniea, 11 of Crystal Lake, watches his hit fly in the air during the home run challenge during the McHenry County Youth Sports Association baseball skills competition Friday, July 27, 2012 at Lippold Park in Crystal Lake. The competition was held in conjunction with the Summer International Championships which runs July 27 - August 5 at various fields in the county. Mike Greene - mgreene@shawmedia.com McHenry County Hurricanes' 15 year-olds Zack Forney (left), of Cary, and David Atkinson, of Lake In the Hills watch the 15 year-old home run challenge during the McHenry County Youth Sports Association baseball skills competition Friday, July 27, 2012 at Lippold Park in Crystal Lake. The competition was held in conjunction with the Summer International Championships which runs July 27 - August 5 at various fields in the county. Mike Greene - mgreene@shawmedia.com Crystal Lake Cardinals' Blake Gleason, 15 of Crystal Lake, warms up with teammates before the McHenry County Youth Sports Association baseball skills competition Friday, July 27, 2012 at Lippold Park in Crystal Lake. The competition was held in conjunction with the Summer International Championships which runs July 27 - August 5 at various fields in the county. 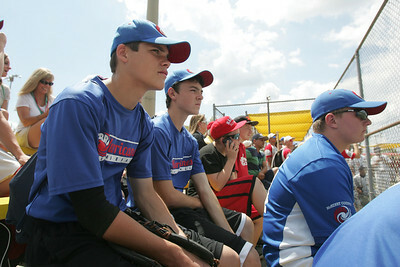 McHenry County Hurricanes' 15 year-olds Zack Forney (left), of Cary, and David Atkinson, of Lake In the Hills watch the 15 year-old home run challenge during the McHenry County Youth Sports Association baseball skills competition Friday, July 27, 2012 at Lippold Park in Crystal Lake. The competition was held in conjunction with the Summer International Championships which runs July 27 - August 5 at various fields in the county.